Luxury custom home builder, architect and interior designer, Phil Kean Design Group, blends modern design elements with unique functionality to create breathtaking environments that offer outstanding “livability.” Growing our reach across the globe, we are currently working on architecture and interior design projects across the Bahamas, Brazil, Canada, England, Ghana, Spain, and Sri Lanka, bringing our signature and distinctive modern design style to faraway lands. One of the unique characteristics of each PKDG project is the blending of indoor and outdoor spaces to create a cohesive and inviting space. This technique is particularly significant in international projects, as it takes a home’s surroundings into consideration, modifying plans to truly harness the incomparable features of a specific region. Whether it’s a lakeside structure in Toronto or a house on the hilltops of Brazil, our team of architects and interior designers is highly skilled in creating a union between the two planes, allowing residents to experience their home in the fullest way possible. From concept to execution, the architects and interior designers at Phil Kean Design Group work with clients to create spaces that, while aesthetically remarkable, are also highly conducive to the lifestyle they want to experience within their custom home. 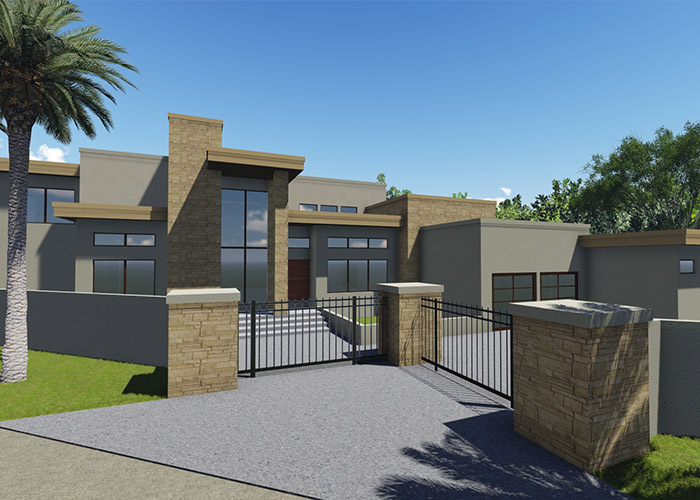 Our team is able to conceptualize, plan and design incredible architecture and interior spaces exclusively created for a client’s unique vision and specific region or parcel of land. Interested in international services? Delve into our portfolio of work to see more of our global projects or contact us directly to learn more about our services.